For all the latest from Penn Yan Public Library. Do you have checked out library materials that have overdue fines on them? For the month of February we are collecting Needs and Things for The Living Well, and if you bring one object from the list below, your fine on one overdue library item being returned will be forgiven. – Fines will only be forgiven on currently checked out items being returned. – One Needs and Things object is required for each overdue item being returned in order for fines to be forgiven. – We cannot offer this program to our patrons who have had their PYPL accounts sent to collections. – We will most happily collect these important items for the Living Well even when patrons do not have any overdue fines! Dish soap, laundry soap, diapers (size 3 and up), baby wipes, toilet paper, paper towels, facial tissues, deodorant, razors and shaving cream, toothpaste, toothbrushes, bar soap, deodorant, shampoo. With its new fiber-to-fiber connection, Penn Yan Public Library is one of three libraries in Yates County to offer ultra-high-speed bandwidth at its public access computers and through its Wi-Fi hotspot. Download and upload speeds are in excess of 100 Megabits per second, much faster than typical cable or DSL connections, and exceed NYS Broadband Standards. High speed broadband connections are now possible in our area thanks to the not-for-profit Southern Tier Network (STN) which has constructed an open access optical fiber network in Steuben, Chemung and Schuyler, and Yates counties. Southern Tier Library System (STLS) and Penn Yan Public Library are directly networked to each other via the STN fiber backbone. Expansion of this collective arrangement will reduce costs for all member libraries that connect to the STLS via the STN fiber network. Funding for the new library connections was provided through New York State’s Construction Aid for Libraries program, with the support of New York State Senator Thomas O’Mara and Assembly members Phil Palmesano and Chris Friend. For the month of February the library is collecting Needs and Things for the Living Well. Library patrons may bring in hygiene and cleaning items to have overdue fines forgiven. Fines will only be forgiven on currently checked out materials being returned. One Needs and Things item is required for each overdue item being returned in order for a fine to be forgiven. The library cannot offer this program to our patrons who have had their PYPL accounts sent to collections. The library will also collect donated items for the Living Well even if a patron does not have any overdue fines. Needs and Things list: dish soap, laundry soap, diapers (size 3 and up), baby wipes, toilet paper, paper towels, facial tissues, deodorant, razors and shaving cream, toothpaste, toothbrushes, bar soap, deodorant and shampoo. When construction begins on the new Penn Yan Public Library parking lot, steps and ramp, the main entrance will be closed. We ask that library patrons please enter through the door located directly across from the main entrance by the coffee machine. There will be temporary handicapped parking spots located in the county lot across from the door. A temporary walkway will be in use. Library patrons have permission to park in the First Presbyterian Church lot when the county lot is full. If parking in this lot, please use the crosswalk at Main and Clinton Streets. We thank everyone for their patience while the library grounds are being improved. 4.1 Patron Registration Requirements: Special First Library Cards (ages 0-5) require the signature of a parent or guardian and an ID which may be the parent’s to prove address. These cards may only be used to check out children’s materials. Examples of children’s materials: All items located in the children’s area of the library, Juvenile nonfiction, Juvenile Audio books and CDs, DVDs marked with an orange dot and story time kits. Video games cannot be checked out with this card. 4.4 Renewals: Two renewals of loan periods per item are granted dependent upon: material type and the presence of a request for the material by another patron (a hold). More renewals may be granted upon staff discretion. 4.8 Interlibrary Loan( ILL)/Holds: All ILL and holds materials should be picked up promptly as loan periods are set by the lending library and may be short. If a reserved item is not picked up from Penn Yan Public Library within the 1 week hold period, the reserve is canceled and the patron is charged a $1.00 non-pickup fine. In July 2014, the meeting will take place on July 31st. Every Tuesday and Thursday afternoon in June stop by the library for a free lemonade! • The Well, located at the Penn Yan UMC (look for the blue canopy on the corner of Chapel and Main Streets) will be open from 8:30-5:00pm. Volunteers can go there to get assignments for clean-up. • At The Well folks can find cleaning supplies, personal care items, paper towels, etc. There is a Red Cross Unit on Main Street that has cleaning kits and bottled water. They are also available to connect you with other resources you may need. If you are unable to receive a tetanus shot from your primary physician and you are concerned that you are at risk, you may come to the Yates County Public Health Office on Monday, May 19 from 9am-11am to get a free tetanus shot. If you are unable to come during that timeframe, you may can 315-536-5160 to schedule an appointment. According to the CDC: Tetanus is an infection caused by bacteria called Clostridium tetani. Tetanus bacteria are everywhere in the environment, including soil, dust and manure. The bacteria can get into the body through broken skin, usually through injuries from contaminated objects. The American Red Cross has a shelter open at the Penn Yan Academy. Other services that they offer are free and you do not have to stay at the shelter to receive: clean up kits, showers, hot meals for people in need, emergency responders included. American Red Cross has a help line 315-536-6841 if individuals have any other needs. Red Cross will be distributing work gloves and clean up kits at the Penn Yan Academy Friday May 16 and Saturday May 17 from 9 am to 2 pm. Tops has donated 7 pallets of paper towels, bleach, water, garbage bags, cleaners and latex gloves. The Living Well have this available for distribution Friday, May 16 beginning at 2:00pm at the Penn Yan United Methodist Church. If folks want their money designated for food, clothing and shelter they should send checks to the American Red Cross – 53 Bayard Street Seneca Falls, NY and indicate for PY Flood Relief. If folks want their money to support longer term needs ( paper towels, laundry detergent, cleaning supplies, etc.) they can make checks out to The Living Well and send or drop them off at the Penn Yan UMC 166 Main St in Penn Yan, New York 14527. Friday, May 16 from 10:00-1:00 (this time may change based on how busy we are but it is a minimum) The Living Well will have a volunteer at the Main Laundry to provide funding and supplies (including laundry detergent, and fabric softener) for folks who have been affected by the flooding who are in need of doing laundry. 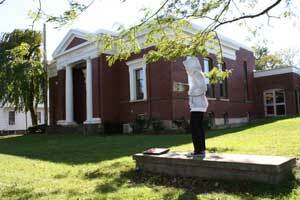 Copyright © 2014 Penn Yan Public Library All Rights Reserved.